The CNY70 is a reflective sensor that includes an infrared emitter and phototransistor in a leaded package with a daylight blocking filter. 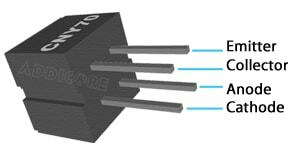 These work great as close-range proximity sensors, tachometers, or line following sensors. The order was shipped and came in quickly. I'm using them for a school project, so I'm not sure of their operation or even if they work.